As phrases go about Kerala: “God’s Own Country,” we mean it. This is a declaration of heavenly provenance that is fully announced on many signboards and stickers seen all over the state. People brand Kerala in this way all over the world as a tourist oriented state. It does not sound over-rating the country because of the beauty of Kerala as we describe it. ‘Just rest your eyes and believe in yourself’- this line precise the feelings you will feel when you visit this wonderful state. Kerala is renowned for its outstanding beauty as it is invoked in the phrase. It also allude to lots of variety of beliefs that flourishes here because people of different religion (Hindus, Christians, Muslims and Jain) and different customs live in this beautiful state. You will notice the combination of miners, towers and spires is boosting the beauty of the town and villages of the state. All these attractions in Kerala will always remind you the title of the state “God’s Own Country” because you will found many gods who was inclined to choose this place as their own to make it or build it as their own way. We arrived in the best tourist places in Kerala, Fort Kochi, which is a renowned picturesque heritage city packed with the remnants of its Dutch, British and Portuguese past, before the Christmas season. Fort Kochi is like an ancient symbol which holds all these colonial memories. When we attended a school concert in front of the Santa Cruz Basilica we were dazzled with the white façade and twin spires of the Fort touching the sky. It was an amazing feeling that’s beyond any description. The glowing paper lanterns all over the sky, hanging over a busy stage where many little charming school girls dressed like angels and performed the Christmas carols for the audience of thousands people. The silent and peaceful night has never sounded as loud as that night but yet it was so universal. A group of teenage girls who were wearing colorful Indian dresses followed the performance and they performed a traditional Indian folk dance with some intricate dancing movement. The combination of traditional pomp and Christmas hymns should have seemed raucous but it appeared to be a flawless appearance of versatile distinctiveness. This distinctiveness extends to the countryside as well. Natural beauty of Kerala is as unique as its people are. You will be amazed with the most beautiful places in Kerala beside the Malabar Coast and the maze of backwater canals, which is running through the large crop field to the glorious green hillside tea garden in the Western Ghats. However, the most enduring eminence of those scenery is the way they revealed in varying shades of luxuriant green, as though the color band had been required to inflate to accommodate the state’s magnificent fecundity. God’s own country Kerala, this name is come from the word ‘kera’. ‘Kera’ is a local Malayalam word coconut. This name is derived because there is plenty of palm trees across the state. The sharp dark green palm leaf the sharp dark green palm leaf is unfolding the natural umbrella against the fierce rays of the sun. The coconut just doesn’t only name the state, it also acts as an omnipresent and compliant natural resource. These coconuts also produce products like toddy, fiber, coir as well as local loom which enable the people to earn to make self-sufficient. Another best tourist places in Kerala is Munner, the hill station of east Kerala is abounded with lots of tea garden, which is another main beverage of the country. Munnar tea estates are very famous for its vibrant shades of green tea plots. It is part of the Western Ghats mountain region. 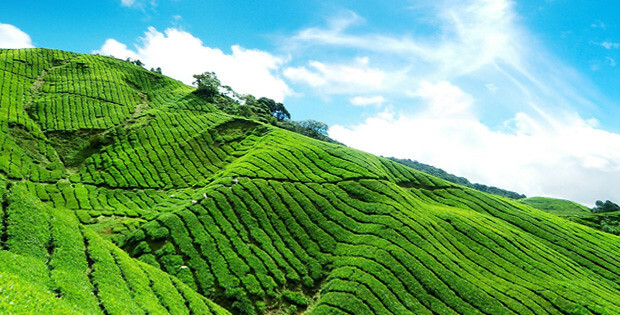 The vertical hillsides are covered with nearly 60000 acres of tea plants. The Munnar tea garden was established by the British colony and was begun in the late nineteenth century. The immense swath of Munnar tea plantation stick to the hills looks like a softy emerald carpet that results in a stunning scenery. You will be amazed with the narrow walkway between the tea bushes. The tea pickers follow the pathways, lead to ornate channel heightening the topography. It looks like the God has drawn it in his way like cartographer and the lines contour onto the mountain slopes. Kerala’s architectural design and urban style will give us the feeling of presence of colonial heritage. The idiosyncratic angles of the rooftop, the design of boulevard as well as the pattern of the brick work of the heritage establishment will resemble like physical legacy of the British colony. The Munnar tourist attractions are fundamentally changed by the British colony because the colonizer left their marks in the streets ad in the hills all around Munnar. The empire’s ravenous appetite for tea comes as the courtesy of the emerald shine of the hillsides. Brave colonists like A.W. Turner and John Daniel Munro have made their ways to the high ranges because they found the gradient, orientation as well as the altitude of the hills which are appropriate foe the tea cultivation. During their time, eucalyptus seeds were smuggled in this province from Australia to provide sufficient wood to run the tea production process. For their enormous effort and dedication, hilltops are now covered with fast growing eucalyptus trees. These trees seem as if they are in severe vertical reprimand to the natural arcs all around the place. Tourist spot in Munnar has been destroyed by some careless overdevelopment as a town because this town is gathered with lots of large hotels rising up is shambolic patterns. But you will find its ancient history as a colonial hill town or mountain station when you see few Christian churches and the High Ranges club in the town like these are conserving like the sun which had never fully set on the realm. The imposed traditions of the residents (from the Mughals to the British) are considered into the local identity as this has happened very often in India. This imposed tradition is incorporated simply into the larger general narratives. Indian people like to drink sweetened tea in every occasion, as it’s an inseparable part of their life. Therefore, the huge tea estates in Munnar express their appetite for tea, which is not only the proud part of their heritage but also an evidence of foreign legacy. We started our journey on the Christmas morning to Eravikulam National Park which is about eight miles away from Munnar. Eravikulam National Park extends over 37 square miles above the line of plants which are giving way from green to yellow-tinged and exposed rock. The tea plantations and treetops are well arranged on the hillside below. From here you can view the beauty of unrivaled scenery of rolling village where rocks are holding pockets of mist to fill some valley. You will see the mysterious lost looking clouds skimming on the highest peak of the mountain. In this part of southern India, the highest mountain, Anamudi mountain is looming over at 8842 feet. Because of its huge chunk of rock and magnificent look, people call it as Elephant Head. 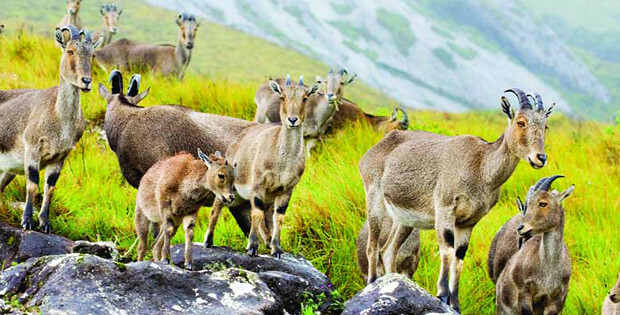 Nilgiri Tahr in Munnar Kerala, is one of the main attractions of Eravikulam. This is a rare class of mountain goat, which was almost vanished 100 years ago. But some of those are still alive. Nearly 3000 goats are in this reserve. You may find some wild elephant in the valley of the mountain and they don’t like to use pathway. But Nilgiri Tahr like to approach the pathway for as their walkway. They mingle with the tourist very easily and they are not harmful. You will find many signs on the wall of mountain which help the tourist not to stray off their way. Most of the signs are written or drawn in English and Malayalam. The voluptuous letters all around the wall and twirls beautifully match the external scenario of the mountain. Basically the word Malayalam means “hill region”. Your eyes will sooth by viewing the beauty of local Kurinji flower. Every year, the harsh grass turns bright blue just like this local flower. Kurinji blooms over the hillside that adds another fuse of color to the nature, just like the nature is offering special interval from the pure greenery view below. We discovered another shade of green of Kerala backwater near the coast. The color of tree plants of the hill side is almost emerald green, the crop field at the valley of mountain is closer to luminous jade fringing with the banana plants as well as palm trees. There is a dense maze of canals, lake and rivers around Kuttanad are mainly known as wetlands. These backwaters of Kerala are near south potion of Vembanad Lake which is one of the largest in India. People believe that Kerala was created when Parasurama threw his battle-axe into the deep sea which resulted in this countryside. Parasurama was incarnation of Lord Vishnu who created this place, which is neither all water nor all land. 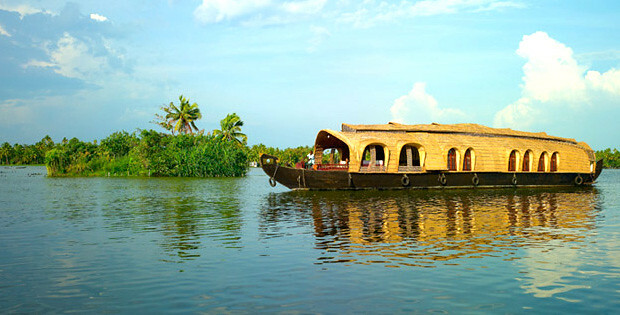 Journey by traditional Kerala backwaters houseboat is one of the classic experience of Kerala. These boats are called as kettuvallam and these boats were used to carry crops and passengers around the water path. Now these are adopted as houseboats. Houseboat generally made with luxury and people pass their free time. They can be found in all shapes and sizes. The roofs of boats are curved toward the water very gracefully. We took a cruise for overnight journey to meet our crew at the very busy coastal city of backwaters in Alleppey. This is one of busy and choked Indian towns, which thrum with the radical energy. In this town, speedy rickshaws and mopeds play real-life role on the streets. You may see some elephant passing through the road in a group. All in one, it is beautiful town. The comparison with the rivers couldn’t be starker. Once you’re on the standard water, the delirium of Alleppey in Kerala ends to a dim storage, changed by a persistent relax. A vacation along the pathways is fascinating — so peaceful, so relaxing that it patterns a type of meditation, like a deep-body massage for your soul. We gradually glance the quotidian appeal of regional life belongs here— the wonderful little bungalows along the rivers. These are adorned with moored vessels instead of parked cars; little stores and toddy bars; several chapels, some daringly contemporary in design, others searching their origins back to the time of St. Johnson, the questioning apostle, who is said to have come in these areas in the 1st millennium. As the houseboat chugs run along, we consistently listen to the sound of cloth hitting against rock as moms do laundry of the family members by the water’s edge while kids quit their favorite games and trend in our route. The leader docks the houseboat below some trees as we paused our journey for lunchtime, and we become diverted by a most uncommon sight. That was an only goose herder on a kayak is gradually chaperoning a head of thousands of quacking geese along the water. The goose was guiding them this way and the geese were keeping a distance with the goose. He activates himself and splashes the water to keep his charges on course, corralling them toward his co-workers on the riverbank. With the geese securely home, the herder goes on to do it all again with another head just like an act of Sisyphean tolerance. Later, we successfully pass a crowded cricket game unfolding in the space between some palm trees, a skinny wicket used on the wiry lawn. The guys use their softball bats professionally, accounting for the shrub trunks as if they were competing gamers. They also stopped and waved their hand to show their unlimited hospitality. As time passed, we take a kayak along a tunnel, moving to little, pretty bungalows, and then walk along to the little blocks near the grain paddies, bending to goose with the large leaf of bananas plants. With the sun establishing to the western, the grain paddies before us shine like iridescent green. It’s a stunning vision, a stunning example of Kerala’s natural charm. We return to the houseboat as night came closer and the beautiful shades turned into black. Whirring insects flew in the air around us, and we listened to a call for prayer echoing from a near mosque minaret and passionate songs drifting over the water from a nearby cathedral. They call Kerala as God’s own country. After experiencing this backwater tourism, you will also start to believe in it. Athira Menon, the author is from Kerala and graduated from University of Calicut, Malappuram there and working on a research on exploring relationship of archeology and nature of Kerala.